About 25 km east of Accra, using the Accra-Aflao road, is one of Ghana's most well-planned cities, Tema. Tema was established in 1962 and its popularly known as the port city. This as a result of it playing host to the largest port in Ghana. Tema was formerly known as Torman, meaning gourd-town. Its name has, over the time, evolved into Tema. This city boasts of one of the most organized neighbourhoods in Ghana divided into twenty-five communities. One may assume these communities are numbered in a progressive and consistent pattern but that is not the case. Just after the motorway roundabout, you find Community 9, followed by Community 8, then 7, 4 and 1. It takes some time to get used to the haphazard community numbering. In 1952, the government of Ghana acquired 166 square kilometres (64 sq mi) of land north of the Tema Harbour and handed it over to the Tema Development Corporation. The "New Town" that was subsequently built on the site was planned as an industrial and residential complex and was commissioned by Ghana's first president, Kwame Nkrumah. It is now a major trading centre, home to Tema Oil Refinery and numerous factories, and is connected to Accra by a highway and railway. The Tema Metropolitan Assembly shares boundaries with Ashaiman Municipal, Adentan Municipal, and Ledzokuku Krowor Municipal to the west respectively, to the east with Kpone Katamanso District, to the North with Dangme West District and to the South with the Gulf of Guinea. Ghana has two seaports with Tema Port being the biggest, handling 80 percent of the country's national exports and imports. The harbour covers a total land area of 3.9 million square meters with the water-enclosed area being 1.7 million square meters. There is also a fishing harbour nearby with facilities that handle fish processing. 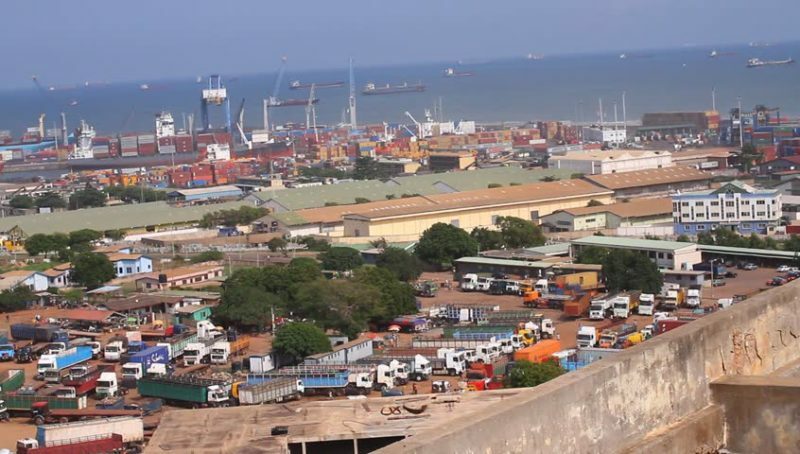 The harbour is situated along the Gulf of Guinea, 18 miles from the capital Accra, and it serves both as a loading and unloading port for goods, both for Ghana and the land-locked countries to the north. Tema Oil Refinery (TOR) is the premier and only refinery in Ghana. The refinery was among the first eight refineries in Africa as at 1963. The refinery is a 45,000 barrel per stream day (bpsd) capacity Crude Distillation Unit and supplies this quantity out of the national demand of 65,000 bpsd. Tema boasts of good road networks and social amenities. The major business centre in Tema can be located in Community 1, although there are pockets of markets in every community. A number of private and public schools can also be found in almost every community in Tema with a few international schools like SOS Hermann-Gmeiner College in Community 6 and Tema International School. In addition, Tema plays host to one of the biggest hospitals in Ghana, the Tema General Hospital. Other hospitals including Tema Women's Hospital, Raphael Hospital, Crystal Hospital are conveniently located within Tema, to take care of your health and emergency needs. Most essentially, Tema enjoys clean drinking water consistently and the general electricity situation in Tema is also pretty decent. The Ghana Police Service also maintains a special policing region devoted to the entire city of Tema, reducing the crime rate in the area. Cost of living is pretty standard for a city. You can buy a plate of waakye for less than 5 cedis in a kiosk or same quantity for close to 10 cedis in the bigger shops depending on where you choose to patronise food. This shows the diversity of the communities in Tema. Buying a house in Tema is not cheap, you should budget at least $100,000 depending on the number of rooms you are going for. Considering the available social amenities, organized nature of the communities, and friendliness of the people, it is a place worth visiting/living in.